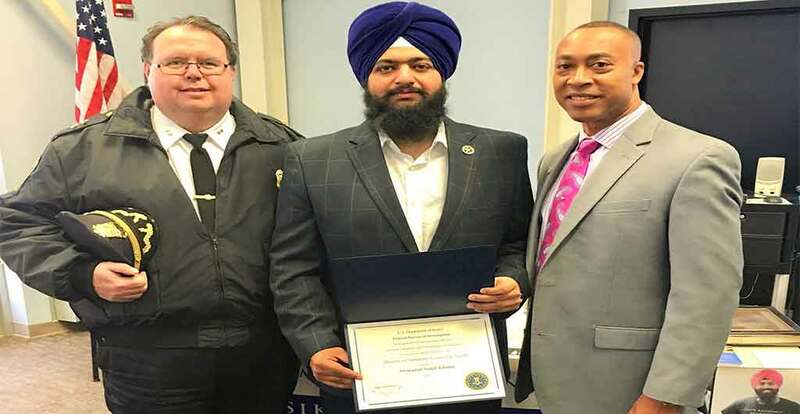 NORWICH, Conecticut, USA—Swaranjit Singh Khalsa, President of Sikh Sewak Society International, was awarded the FBI Director’s Community Leadership Award this week. In April, he will travel to Washington, D.C., where he’ll receive a tour of FBI headquarters and will be celebrated along with the other award recipients during a ceremony. The vetting process for the award is extensive, according to FBI Community Outreach Specialist Charles Grady. A community or law enforcement agency nominates the person. A special agent in charge reviews and narrows down the nominees. Members of the FBI conduct interviews to learn how much of an impact the person has made. Agent Grady said Khalsa was chosen for his work with the U.S. Attorney’s Office and the FBI to help educate law enforcement officers about cultural differences in Connecticut. Swaranjit Singh Khalsa came to the city of Norwich in 2010, after graduating in New Jersey. He also serves as a Member in Commission of City Planning, whilst running his own real estate business and gas station. He was personally held Connecticut’s first ever Sikh Awareness Day at his gas station. Dozens of people including historians, police officers and local residents, turned up. This became the ice-breaker for number of community based meets. An award he received Wednesday at the 10th annual Interfaith Spiritual Wellness Fair — the FBI Director’s Community Leadership Award — symbolizes how far-reaching his efforts have been in the years since. The recognition is granted yearly to 56 people — one for each of the FBI’s field offices. In Connecticut, the Sikh population has been growing for years, Khalsa said. The rise of hate crime against Sikhs and the Winconsin shootings prompted Khalsa to become proactive. “Sometimes it’s just the fear of the unknown,” Singh Khalsa said. That’s part of why he got involved educating officers about not only Sikhs, but also Muslims and Arabs. For example, he said, one of the five articles of faith all baptized Sikhs are required to wear is the Kirpan, an iron dagger that varies in size. It’s meant to be symbolic of the struggle between good and evil, and those wearing it don’t consider it a weapon any more than those who wear a cross consider that a torture instrument.